Discussion in 'Hardware' started by chuckpie85, Oct 25, 2018. I have tried different pod mods and wasn't a fan. I'd like to try a juul as a last attempt. I would only need a device and charger. So if you have one you can spare send me a message. I have a unopened starter kit I can sell you. 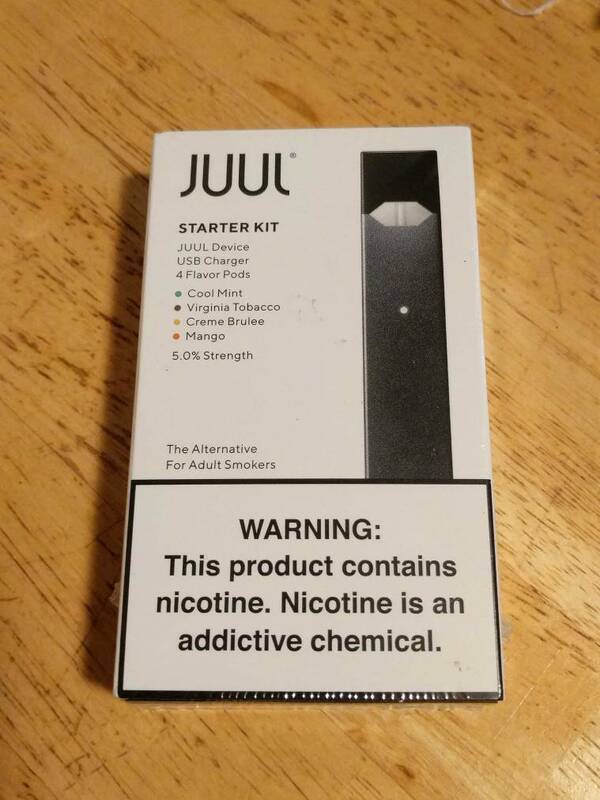 I have a factory sealed Juul kit. Comes with 4 pod asortment. Also have 5 boxes of Juul compatible pods. Pineapple and watermelon, 4 pods per pack at 60 mg. salt nic. Want to trade for gear. Thank you. PM if interested. That will keep you Juuling for a while. I just bought a myblu starter kit for $1 at speedway. Just using it to hold me over until my polar comes this week. They're not too bad. You can pop the top off the pod and refill it with your own juice. There's a video on YouTube. I bought 4 a while back. Got a 12mg in one and 9mg nic salts in another. Yeah, the only issue with doing that with BOs and these is that the coil in the pod eventually burns out. Using external juices makes them go quicker. They're designed for one time use but if you do refill them I prob would only do it maybe once. However, I have 2 others and by then my Polar will be here. These are nice tho for in the bed. Definitely will use these now and then. Yeah, don't think you can. They're built into the pod. Once they're cooked. You toss em. I've refilled mine at least twenty times, lol. I've even replaced the wick. The coil can be replaced too ( it's accessible ) but doing so would be pretty tedious. It's not worth my time but I have heard of others actually doing it. For what it's worth, the fact that I use my own juice which doesn't use much, if any, sweetener ( unlike commercial juices ) probably helps to extend the effective life of the coil.